Back in the year 2000, the Journal of the American Medical Association ran a report projecting a nursing shortage of 500,000 registered nurses by the year 2020. But if you’re an RN looking for work in the 21st century, you know that things haven’t exactly worked out that way. There is a nursing shortage – in some states, at certain types of facilities, and for experienced nurses. 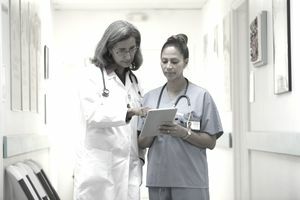 For example, Purdue University projects that seven states will having nursing shortfalls by 2030: California, Texas, New Jersey, South Carolina, Alaska, Georgia, and South Dakota. And U.S. News points out that even in areas without a nursing shortage, some facilities are having trouble hiring enough nurses, including rural hospitals, nursing homes, and rehabilitation hospitals. Even if you live in an area without a shortfall and aren’t looking to work in those environments, nursing is a growing profession. The Bureau of Labor Statistics estimates that this occupation will grow 15 percent between 2016 and 2016, adding over 400,000 jobs nationwide. But regardless of where you’re looking for a nursing job, it pays to prepare to answer some tough interview questions during the hiring process. In addition to technical questions related to the job, you should practice responses to questions about the experience of working as a nurse. These can include questions about why you chose nursing as a career, how you handle stress on the job, and what you find most rewarding about being a nurse. How Would You Deal With a Rude Doctor? When you answer this question, try to remain positive. Now is not the time to badmouth your current or former colleagues. Look for an opportunity to emphasize your ability to deal with people when they’re not at their best. This will reflect well on you without making the hiring manager worry that you’ll have negative things to say about your prospective colleagues in similar situations. I have been very lucky in that I have had the good fortune to work with doctors who were always professional in their interactions with me. If I were to work with a doctor who treats me badly, I would bring the matter to my supervisor right away. That's because, if the doctor was displeased with me in some way, I would want to find out so that I could take action to rectify the situation. Once when I was working in a rehabilitation facility, I had the experience of a doctor going to my supervisor and asking that I be taken off a particular patient’s case. I asked my supervisor if I could discuss this directly with the doctor because I wanted to know from her what was wrong. I asked the doctor if there was something in my care of the patient that she felt needed improvement. It turned out that there had been a miscommunication about scheduling, and the doctor wanted the patient to have continuity in their nursing care. Once I understood that it wasn’t personal, I was relieved, and the doctor and I went on to work well together for several years. If it were a one-time occurrence, I would assume he or she was having a bad day. There was one doctor in the last hospital where I worked, who was always short with the nurses. I talked to my supervisor, and he let me know that it wasn’t just me, that this doctor was going through some personal difficulties that were affecting his ability to perform properly at work. As it turned out, the doctor was able to take a leave of absence, and when he returned, he was much easier to get along with. I had an experience like this with one doctor in a medical group where I worked for several years. He was somewhat brusque with most people on the team, but I felt that he had a lot of criticism for me in particular. I brought the issue to my supervisor, who tried to find out if the doctor felt that I wasn’t doing my job. Everyone else at the facility was pleased with my job performance, so my supervisor re-arranged my schedule enabling to spend more time working with other doctors.